Only available from Hammacher Schlemmer, this six-outlet outdoor stake has a built-in timer and swiveling sockets for conveniently powering lights and holiday decorations. The grounded 12" stake has six power outlets, three of which swivel 180° degrees for plugging in Christmas lights, lawn ornaments, and other outdoor elements without the tripping hazard and tangles posed by multiple extension cords. The stake can be set to keep the lights on at all times, or to automatically turn them on at dusk and off after 2, 4, 6, or 8 hours or with the sunrise. All components are shielded from precipitation, held safely above the ground, and protected with a circuit breaker. 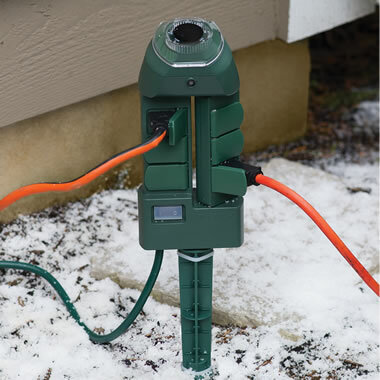 The green stake camouflages with trees and foliage and plugs into AC with an extra-long 20' cord. Supports up to 1,625 watts. 15" H x 3 3/4" W x 3" D.
The Outdoor Christmas Decorator's Timer comes with The Hammacher Schlemmer Lifetime Guarantee. Items that we sell are guaranteed for their normal life under standard non-commercial use.